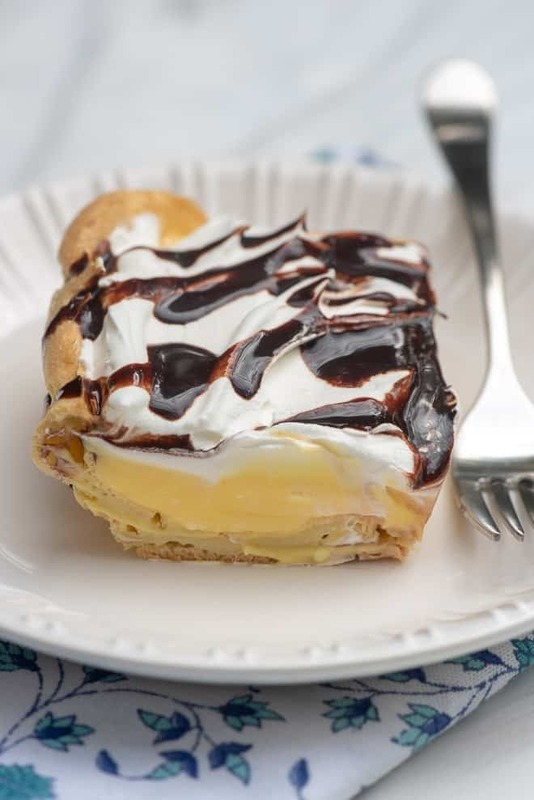 If you are fan of cream puffs you are going to LOVE this Easy Cream Puff Dessert. 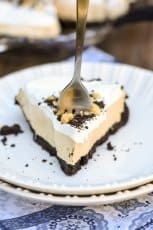 It’s a seriously impressive but incredibly easy make-ahead dessert that is a great choice for any gathering. Ahhh, cream puffs. They are hands down my favorite dessert. My mom was a master at creating the most delectable cream puffs I’ve ever had in my life. I used to request them each year on my birthday and she always obliged. Such wonderful memories. If, like me, you’re a cream puff nut, you’ve just got to try this recipe! It really hits the nail on the head in the flavor department. But it’s also completely fuss-free to create and makes enough to serve a crowd. If you’re looking for something simple but delicious to add to your Easter dessert menu, this is it, friends! 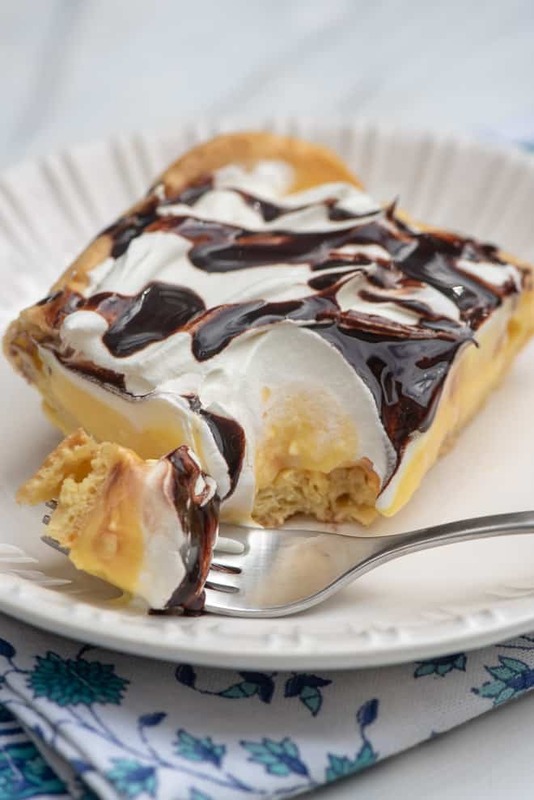 Creating the cream puff pastry crust for this dessert is magical! 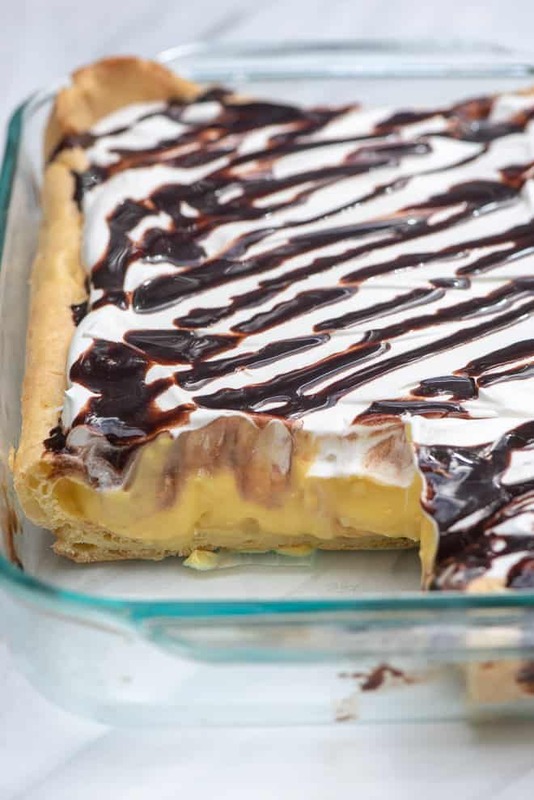 The ingredients and method are the same you would use to create individual cream puffs but instead of dropping the pastry dough in small dollops on a baking sheet, it is pressed into the bottom a 13- x 9-inch pan. As the crust bakes, it rises up the sides of the pan to create the perfect shell-like crust for the filling. This would be a very fun recipe to make with little ones. Watching the crust rise up the sides of the pan is almost like a science experiment. Do not fear cream puff pastry! It is surprisingly easy to make. In fact, if you can boil water, you can make cream puff pastry. Seriously. Take a look at the recipe card at the end of this post for the details. 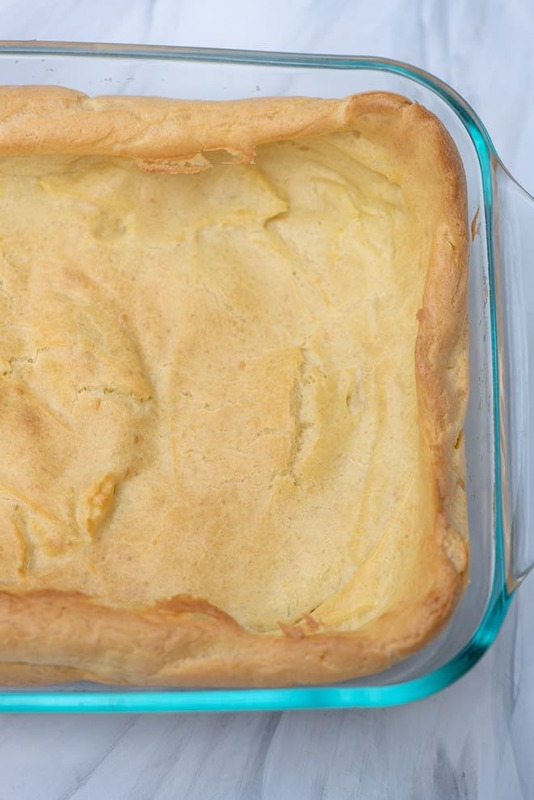 Once the crust is completely cool you’ll fill it with a creamy, custard-y filling that is whipped up in nothing flat. It consists of boxed instant pudding mix, a package of softened cream cheese and milk. 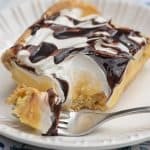 Once you fill the crust with the pudding mixture it’s time to spread it with whipped topping and pop it in the refrigerator to chill for a couple of hours. Be sure your cream cheese is softened before beginning. It should sit out on your kitchen counter for 45 to 60 minutes so it will blend easily. Make sure you pick up instant pudding and not the regular pudding mix that requires cooking on the stove. Instant pudding is clearly labeled as such. 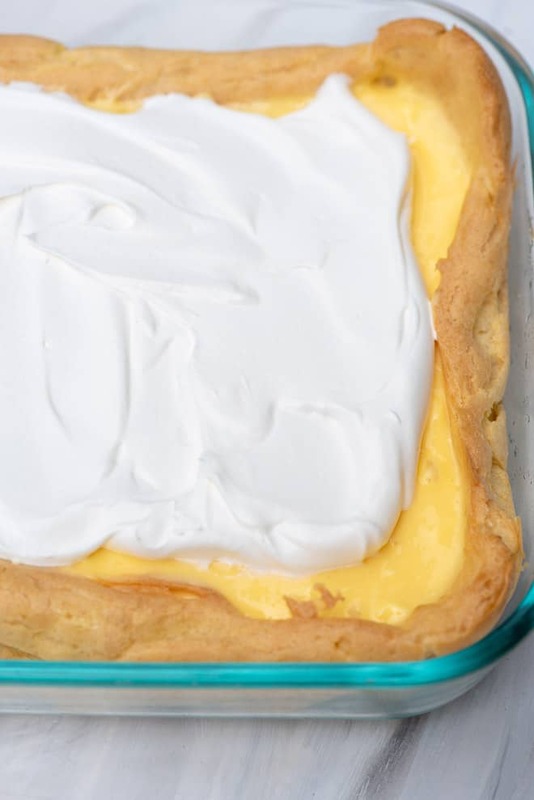 I love using Jell-O French Vanilla Instant Pudding for this recipe. It really nails that familiar cream puff custard flavor. If your store doesn’t carry the French Vanilla – just go with plain vanilla and add about 1/2 teaspoon of pure vanilla extract for a similar effect. Not feeling vanilla? Get creative! Browse the instant pudding selection at your store and choose something that calls to you. Cheesecake, White Chocolate, and Coconut Cream would ALL be amazing in this. 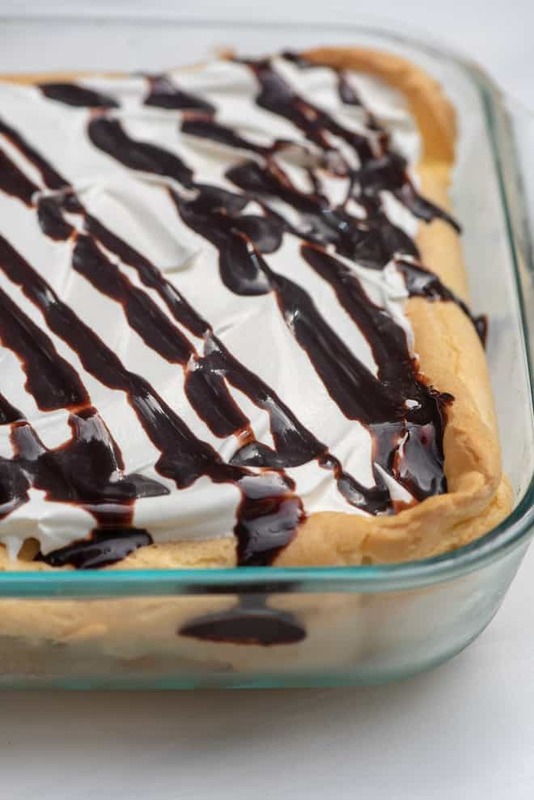 Just before serving, drizzle it with a little chocolate syrup. Pick up the type in the plastic squeeze bottle from the store to make it even easier. 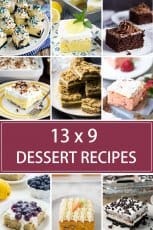 I love 13- x 9-inch desserts for entertaining. They are easy to transport and you can slice and serve pieces of varying sizes depending on who, and how many, you are serving. 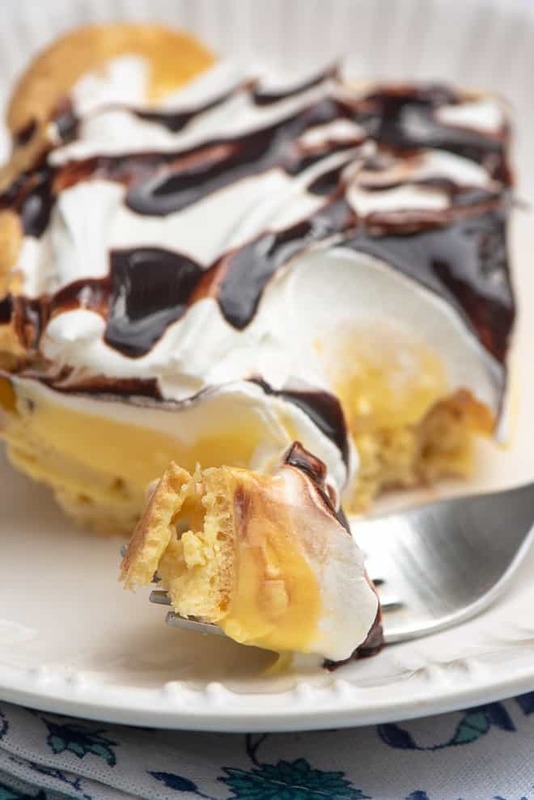 If you are fan of cream puffs you are going to LOVE this Easy Cream Puff Dessert. 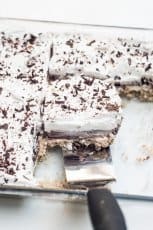 It's a seriously impressive but incredibly easy make-ahead dessert that is a great choice for any gathering. 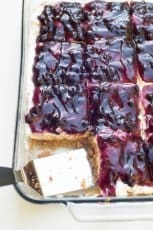 Preheat oven to 400 degrees F. Lightly coat a 13- x 9-inch baking pan with non-stick cooking spray. Add the butter and water to a heavy saucepan and place over MEDIUM heat. Cook until the butter has melted and then bring the mixture to a boil. Remove the pan from the heat and use a wooden spoon to stir in the flour until the mixture pulls away from the sides of the pan and forms a soft ball. Transfer the dough to a large mixing bowl and let it rest for about 5 minutes to cool slightly. Add eggs one at a time, mixing thoroughly with an electric mixer in between additions. Once all eggs have been added, continue to mix for a minute or two or until the mixture is smooth.Transfer the dough to the prepared baking dish. Spread the sticky dough out evenly over the bottom of the prepared baking dish. To make it easier, spray the backside of an offset spatula with non-stick cooking spray and use it to spread the dough. Bake for 20 to 23 minutes or until puffed up the sides of the pan and golden brown. Remove from the oven and cool completely. Place softened cream cheese and 1 cup milk in a large mixing bowl and beat thoroughly with an electric mixer until the mixture is smooth. If there are small bits of cream cheese that don't completely incorporate, it's fine. Just beat the mixture so that it is as smooth as possible (starting with room temperature cream cheese will make this step easier). Add remaining milk and the pudding mix and beat again for several minutes on high speed until thickened. Spread the pudding mixture over the completely cooled crust. Spread the whipped topping over the pudding mixture and use an offset spatula or the back of a spoon to smooth it out. Chill for at least an hour or overnight. Total time does not include time for crust to cool or chilling time. If you can't find French Vanilla Pudding you can substitute regular vanilla and add 1/2 teaspoon vanilla extract. It is also delicious prepared with a variety of different flavored puddings - Cheesecake, White Chocolate, or Coconut Cream are great choices. I like this dessert best when it is chilled for 2 to 4 hours. Chilling it overnight will soften the crust a bit but it is still wonderful. I love cream puffs!! Whoever thought of putting the dough in a 9×13 pan?!?! This would make cream puffs super easy and everyone could choose the size serving they want. I cannot wait to try this!! I hope you try it and love it as much as we do! I sure would love a video of making this. Especially the cream puff part which I’ve never done before. We’re going to do our darndest to get one up before Easter!